Yesterday was sour, for some reason. I have ideas about those reasons, but they’re vague and we’re moving on. The day before, on the other hand, waiting for my son to finish some video game sequence so he could come hold the ladder for me, as I prepared to crawl on the roof to check on a leak, I ended up just swinging my leg over and getting up without any help at all. Turns out when you weigh 155 and are pretty flexible from a lot of walking, you can do that now. Good to know. Never will happen again, probably. While I was up there, I also scraped some moss off the garage roof (my power washer is missing a part, somehow roaming around the garage, so I used a straight-edge hoe; there wasn’t a lot, anyway), which my son, finally arriving in horror to find out that the old man was wandering around on the roof, graciously swept up. So, I mean. That was a pretty active day. Yesterday was weird, that’s all. There were a lot of rejection vibes, and I was feeling just overall disrespected and kind of worthless. Also friendless. None of this is true; all of this, in fact, is kind of crazy. As am I, I guess. I guess I could use some of that magic brain medicine. It’s probably not outrageous to suggest that a stay in a hospital might be in order; a guy who’s had trouble with depression and appetite in the past, who’s lost nearly 20 pounds since January? Yeah. Not quite sure what to do about that. Try not to lose any more, I guess. BUT…so much positive, in a way. Yesterday, sort of inspired by the ennui (is that a thing? Felt like a thing), I started a project that I’ve always been pretty sure would have to be started after I died, when I had more time. Seriously, thought I’d just be doing it in ghost form or something. Years ago, I digitized our home video, because I had a video camera in the early 80s and I used it. This was before I had a handle on editing video with software, so I just put them on DVDs. But there were so many more, and most of them were full-length recordings of operas and concerts my wife gave back in the early 1990s. I finally ended up with about a dozen VHS tapes, stuck in a closet, and grabbed my three blank DVDs I had sitting around and transferred, and that was a lot of fun. This was Julie Kae at her prime, and when I get around to finishing this project I’ll share some and then you’ll understand. I’m not even going to try to clean this up—video is too old and it’s just a screenshot anyway. I’ve always been the archivist. It’s a powerful urge in me, to preserve. I remember the stories, I take the video, I take the pictures. 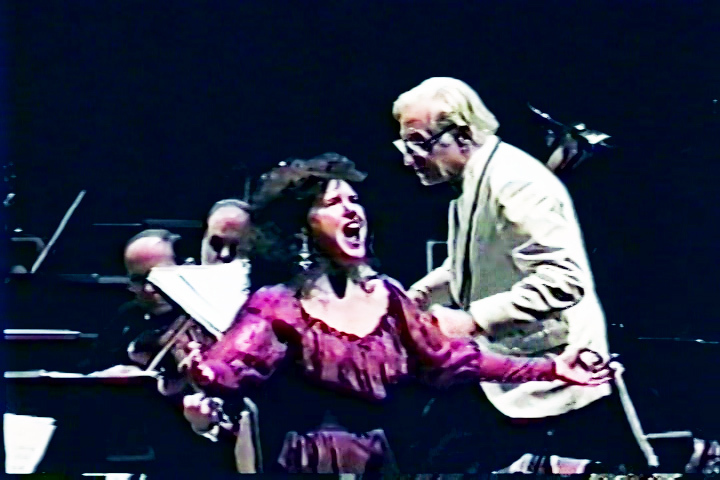 My wife remembers little of this (had absolutely no memory of a concert I showed her last night, big aria from Traviata with a full orchestra and nada, no recall). Some of this is just a lot of performances, some may be from her brain tumor residua, but I think mostly she’s just a forward-looking person. Sentimental, sure, but not really nostalgic. That’s my job. It might be my job, too. I’m not going to turn into a mobile digitizing truck, but I know how to tell stories and people have stories (and photos, and videos), and some of them may be in need of a ghost archivist. I’ve been playing around with this idea for a while. Not even as a way to make money, although I’d have to make some money. Just as a way to preserve lives, other lives. It seems useful. I’d like to be useful, and not so much with the climbing on the roof stuff, either.